Sandals Resorts is joining the romantic revelry surrounding the nuptials of Prince Harry to American celebrity Meghan Markle, creating a new wedding inspiration, English Royalty, the first to debut since last year’s successful launch of Aisle to Isle, a destination wedding experience designed to give couples endless choices. 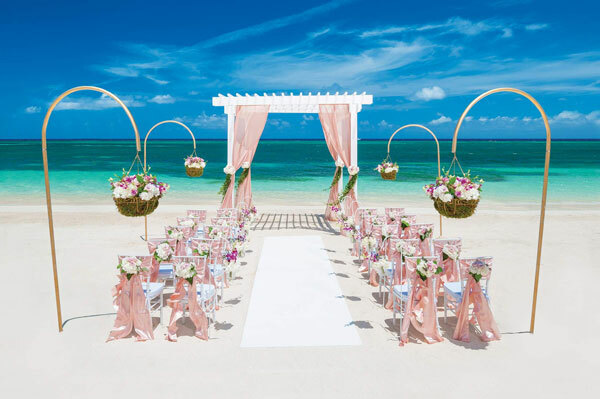 According to Sandals Resorts Director of Romance Marsha-Ann Brown, millennial brides and grooms seek inspiration and information above all else when planning their wedding celebration and no other happening this year is more stirring than the wedding of Harry to Meghan. Available for purchase beginning May 14 for weddings taking place as soon as September, English Royalty was designed for brides and grooms who seek to infuse classic and royal hues into their celebration, along with the modern elegance Meghan has displayed since entering the Royal circuit. Prominently featured within the design of the inspiration are regal accents like purple, perennial emerald green, and the new classic, blush – a favourite of the bride-to-be based on her recent fashion choices. The inspiration further comes to life with floral options including a blush and purple rose centrepiece and filled baskets arranged on oversized gold shepherd hooks and used to frame the ceremony aisle pathway, or to add flair as a hanging centrepiece over reception tables. Charming hobnail mason jars and cone bouquets — each featuring hydrangeas, roses, lavender and stock round out the new look. In addition to the lavish new wedding inspiration, Sandals is also celebrating with a romantic package, “royal-themed” spa services and watch party and a chance to win a seven-night vacation for two in a Love Nest Suite with service provided by a butler trained expressly for Sandals Resorts by the Professional Guild of English Butlers. Couples will be treated like royalty with the debut of The Royal Honeymoon package. A posh upgrade, available now through May 31 for US$750 per couple, the package features a special honeymoon mimosa breakfast-in-bed any morning of choice; 90-minute Night Blooming Jasmine Couples Massage; private candlelight dinner under the stars with a bottle of chilled Prosecco wine; Sandals’ signature 5 Senses of Love In-Room Experience including the sound of sparkling wine, taste of sweet chocolate covered fruit, the scent of soothing essential oil aroma, along with the sight of vibrant silk red rose petals; framed 8×10 Photo Keepsake and late checkout. This romantic experience can be added on to stays in any of Sandals Resorts’ luxurious rooms and suites – from Sandals Grenada’s Skypool Suites to Sandals South Coast’s Over-the-Water Bungalows. Couples who return for their anniversary, receive that night free. Guests staying at any Sandals resort during the days leading up to the Royal Wedding celebration can create their own “Royal” experience with these activities and events: On Thursdays, guests have the chance to give back like a Royal with the Sandals Foundation and the Reading Road Trip experience. On Friday, a spa day would be in order at Sandals’ signature Red Lane Spa, who makes couples feel like royalty every day. A few of their “royal” worthy treatments include Night Blooming Jasmine Couples Massage, the Exuberant Bride Package, Gentlemen’s Hot Whiskey Scour, Caribbean Glow Body Treatment and Champagne Celebration. Then, on Saturday morning, couples can treat themselves to the romantic Royal Wedding Breakfast in Bed package, available exclusively on the morning of May 19. As the ultimate watch party, the experience includes a choice of a bottle of Ruffino Prosecco or Ruffino Prosecco Rosé, chocolate covered fruits and traditional English scones with cottage cream and jams for US$50 per couple. For those opting to watch the Royal Wedding with fellow guests, the resorts will also host watch parties featuring special English breakfast treats and a “spiked” tea party. Finally, Sandals is giving couples the chance to Vacation Like a Royal when they enter the brand’s Vacation Like a Royal sweepstakes between May 14-31 at www.sandals.com/Royal. The prize includes a seven-night/eight-day Luxury Included stay for two to any one of the brand’s “Royal” resorts including Sandals Royal Caribbean or Sandals Royal Plantation in Jamaica, Sandals Royal Barbados or Sandals Royal Bahamian, featuring transfers between airport and hotel, luxury accommodations; 5-Star Global Gourmet dining, ensuring premium liquor and wines and gourmet specialty restaurants, watersports, nightly entertainment and much more. Trips are offered on a space available basis and do not include airfare. Certain restrictions apply.